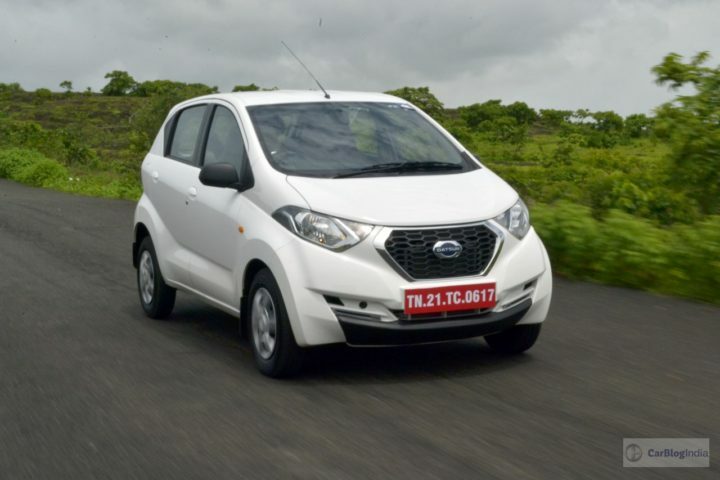 Datsun Redi Go 1000cc Review – Redi, Set, Go! Yes, there’s not much that differentiates the new 1000cc model from its less powerful sibling. 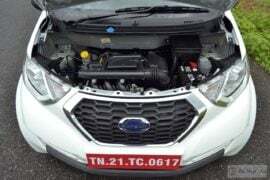 The Redi Go 1000cc engine variant is available only in the top 2 trims (S and T(O)), which means bits like some chrome appliques and stylish LED DRLs and jazz up the exterior a fair bit. 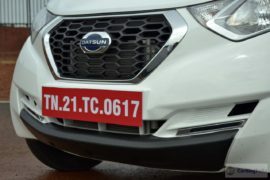 The trim levels also get you slightly updated bumpers, which come with a black lower lips, but there’s really not much to tell the two engine variants apart. Okay, there’s a ‘1.0’ badge on the bootlid, but there’s little else to make this car look any different from its lesser sibling. The car misses out on alloy wheels. 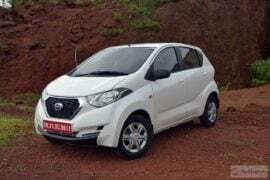 Also, unlike the Kwid 1.0, the new Redi Go 1000cc models do not get any sort of graphics or body decals to announce the bigger engine credentials. 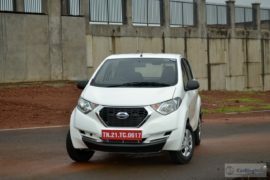 Much like the exterior, the interior of the Redi Go 1000cc isn’t too different from that of its less powerful variant. The biggest change here is the all-black theme instead of the lighter tones for the 800cc version’s cabin. 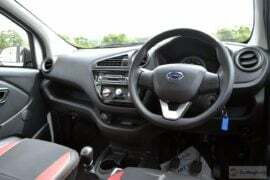 You also get a silver finish around the side aircon vents and on the sporty three-spoke steering wheel. There’s a new button for central locking and the 1000cc version gets remote locking. 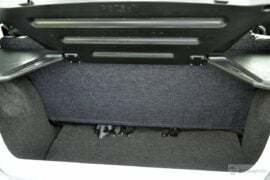 Other than this you can also get the optional Black-red seat covers for your 1000cc Redi Go. So, basically, the new variant looks almost the same as its less powerful sibling with only little to differentiate between the two cars. 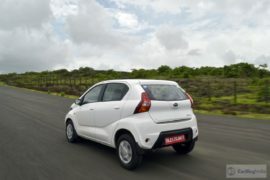 The new Redi Go 1.0 gets a 1.0-litre iSAT three-cylinder petrol engine that outputs a max. power of 67 BHP at 5,500 RPM and a peak torque of 91 Nm at 4,250 RPM. 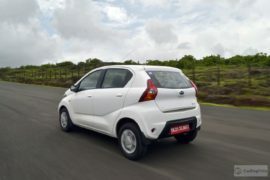 In comparison, the less powerful 0.8-litre motor manages to output just 53 BHP-72 Nm. The new engine will initially go on sale with a 5-speed Manual Transmission only. 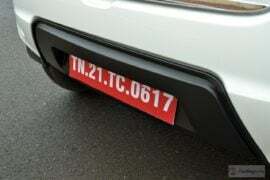 However, an AMT option shouldn’t be too far in the offing. Thanks to a significant increase in power, the Redi Go feels a lot more energetic throughout the rev range. 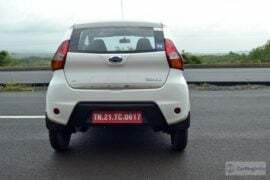 While the engine doesn’t exhibit the kind of peppiness that the Alto’s brilliant K10 engine is known for, there’s still sufficient punch on offer. Compared to the less powerful 0.8-litre model, this car isn’t much quicker off the block. 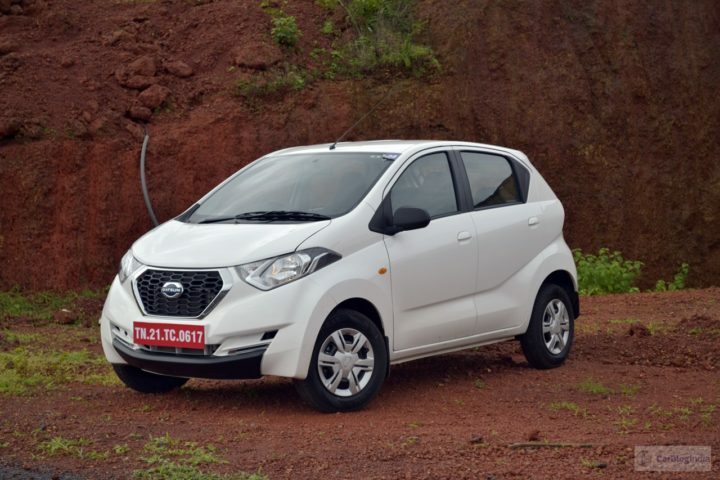 However, it’s the mid-range where the new Redi Go 1.0 delivers a much stronger performance. 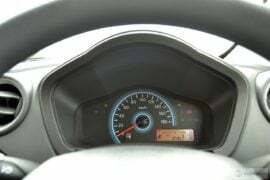 Overtaking fast-moving traffic no longer takes months of planning and the new car can easily hit around 140 KMPH on the speedo. The only real complain we have here is with the high NVH levels. The engine isn’t a very quite unit and gets fairly audible as you floor the pedal. There’s also some wind noise at high speeds. 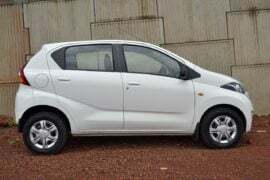 The Alto K10, in comparison, feels more refined. 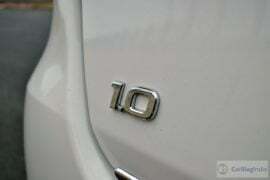 However, this engine makes up for all the lack of refinement with its really high fuel efficiency. The new Datsun Redi Go 1.0 boasts an ARAI mileage of 22.5 KMPL, which is 0.33 KMPL higher than what the Kwid 1.0 offers and just 0.2 KMPL lesser than 0.8-litre Redi Go’s fuel mileage. 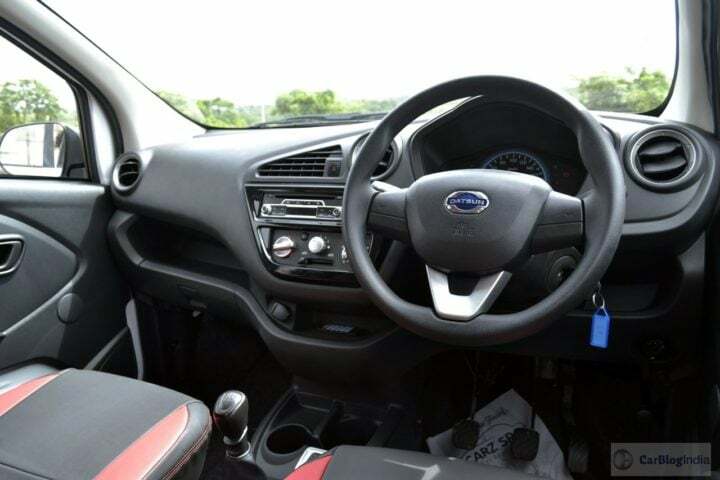 It’s worth a mention here that the suspension settings on the Redi Go have been left untouched, which means the car continues to offer a decent ride quality and neutral handling characteristics. The steering continues to be too light and uninspiring. 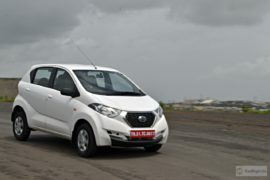 The Datsun Redi Go has always impressed us with its crossover-ish design, a spacious cabin, a really high ground clearance of 185 mm and an attractive price tag. The new 1.0-litre variant possesses all these traits, but the new 1.0-litre engine makes the entire package even more attractive. 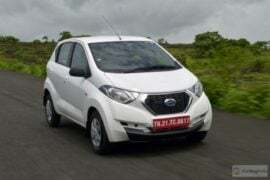 The new 1000cc Redi Go is for all those who’ve stayed away from this entry-level Datsun due to the lackluster performance of the 0.8-litre engine. 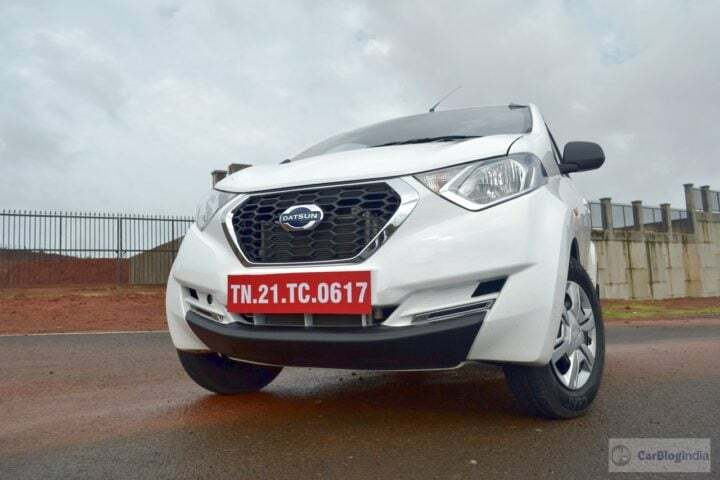 True, bits like an uninspiring steering and high NVH levels stick out like a sore thumb, but there’s still a lot going for the new Datsun Redi Go 1.0. 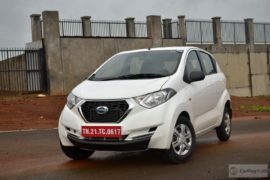 What do you think about our new Datsun Redi Go 1000cc test drive review? Do share your views by penning them down below. Stay tuned for more posts like the Datsun Redi Go 1000cc test drive review here.